You are here: Home / Business / Latham: health care reform needed, but he opposes "public option"
Latham: health care reform needed, but he opposes "public option"
Congressman Tom Latham, a Republican from Ames, says there is a need for health care reform, but he’s opposed to creating a government-run plan to compete with private insurance. "There are too many people today that don’t have access to affordable health insurance, affordable health care," Latham says. "The system in Iowa when you look at Medicare, the reimbursement issues that have hurt us so much, that caused a lot of doctors not to practice in Iowa to go to higher reimbursement areas of the country — those issues are very, very real." But Latham says the three health care reform bills that have passed committees in the Democratically-controlled U.S. House are not the answer. "There is a large concern about what is the government’s role, are these things that we can do on a free-market basis that will actually solve the problem without having the government intervene and take over that one-sixth of our economy?" Latham asks. According to Latham, it’s time to take a "step back" and find a "bipartisan solution." One alternative to a government-run health care plan that seems to be emerging is health care "coops," but Latham says he doesn’t yet know enough about the details to say whether he’d support or oppose coops. "I don’t think anybody knows what it is yet," Latham says. "…Are they truly independent? Are they truly member-owned? Our perception of what a coop is obviously has to do with the farmers coop elevators and the rural electrics, things like that…It’s all a matter of how it’s billed." However, Latham says at "first blush" he’s inclined to say he would oppose health care coops because coop architects say coops would need a government investment to get started. "Now, if in fact it is truly independent, if any funds that were lent to it had to be repaid…you could maybe justify start-up costs, but there would have to be…an iron-clad agreement that they would pay that money back," Latham says. "And they may need money to (pay) initial claims until the revenue’s generated." Those revenues would come from premium payments of coop members. 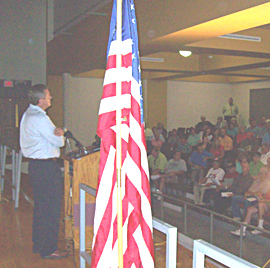 Latham made his comments earlier this afternoon to a crowd of over a hundred who showed up for Latham’s "town hall" meeting in Indianola. Click on the audio link below to listen to the entire event.